Kuta car rental is the best option to rent a car whether in manual or automatic transmission. As we located in Poppies Lane 1 so we are very close in Kuta area and able to deliver the car in in a minute. The car rental in Kuta is never been so easy to find while you stay in this most bustling area of Bali. Jalan Pantai Kuta (or Pantai Kuta street) is the most famous street name in Kuta. Along the street, at the left side, existed the legendary-famous Kuta beach, where people do surfing, sunbathing, sports, just walking along the beach, etc. While at the right side you can see a row of 5 stars hotel such as Hard Rock Hotel, Mercure Hotel, The Stone, Sheraton Hotel, Accor Hotel, etc. And of course there are also many small hotels such as inn, bungalow or home stay just behind those hotel chain. Toyota Innova car rental ready to take you anywhere! In short Kuta is the most crowded area in Bali. It also offering all of the magnificent of Bali. Beautiful Kuta beach, complete shopping corner, various night life, restaurants, great hotel accommodations and many more! Great place for the young traveler to go around is Bali island paradise, as good as Bali sports that a must do and visit. So driving a small car is advisable. The small size car, epecially for the automatic gear one, is the best choice to rent a car in Kuta. For the example is the Toyota Agya. This automatic 4 seater car is perfect car to be rented when you stay in Kuta area. 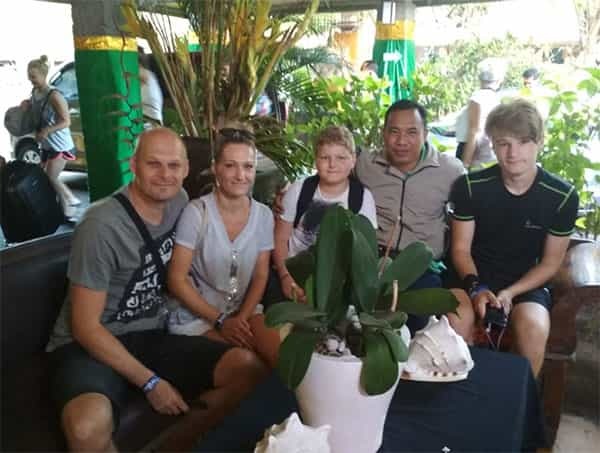 But of course if you travel with a large number of family, e.g with three children renting another bigger one such as the Toyota Avanza (7 seater) or the Toyota Innvoa (8 seater) could be the best one. For those who travel in Bali and especially look for some budget hotel in Kuta try to find it in Poppies lane. There are 2 lanes there, Poppies Lane 1 and Poppies Lane 2. Both of them is famous along the tourist. And both of them offering some great budget hotel to try, but still with hospitality beyond standard. For the budget traveler who will also need a transportation or car rental, we advise you to take a small size car rental such as the Toyota Agya or the Suzuki Karimun Estilo. These 4 seater car is just perfect to explore the island starting from Kuta. 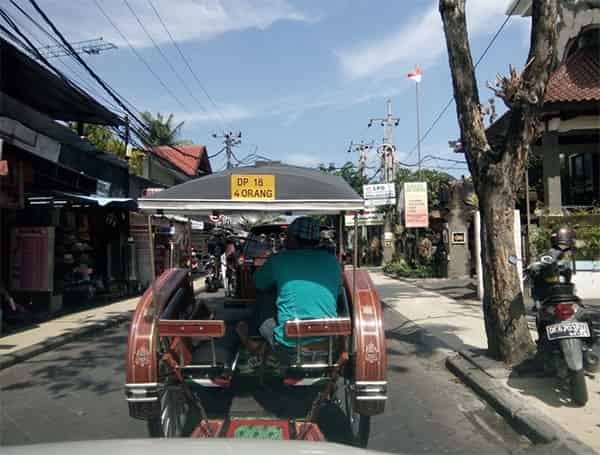 When you drive along Kuta street sometime you will see a traditional Balinese and Indonesian vehicle, it is called Delman. In English it mean horse drawn. It is actualy provided by the government to support Kuta tourism, by providing a traditional transportation in the tourism area. And we see many tourist who tried the Delman and enjoy the riding for about 30 minutes riding that horse at the back. The large dining area on this top floor restaurant and bar in Kuta Bali gives the patron a huge selection of tantalizing Italian foods option. Including fresh pantas and change - 20 different types of pizzas to go with grilled imported meats. Location is on Jalan Legian in Legian Kuta. This long serving restaurant on Poppies Lane 1 in Kuta is something of a landmark. Its mixed menu caters for all and diners get to relax under the shaded terrace making it popular for all. Situated a few steps from Bemo corner between Poppies Lane 1 and Jalan Pantai Kuta, Un's offers good service and excellent meat dishes, including arguably the best beed in Bali. A great place for a romantic candlelit dinner accompanied by Batak musicians. Authentic restaurant cuisine, a pristine kitchen and a lively atmosphere. While you eat you can easily see the sunset at Kuta Beach as the cafe facing to the sea. Papa's cafe is excellent for steaks, seafood and great pizzas. A local dining institution. Always busy, the combination of good food, value for money and stylish decor has made this eatery one of Kuta's famous. A 'place to be seen' - if that's what you want. Located on Jalan Raya Seminyak, Kuta Bali. 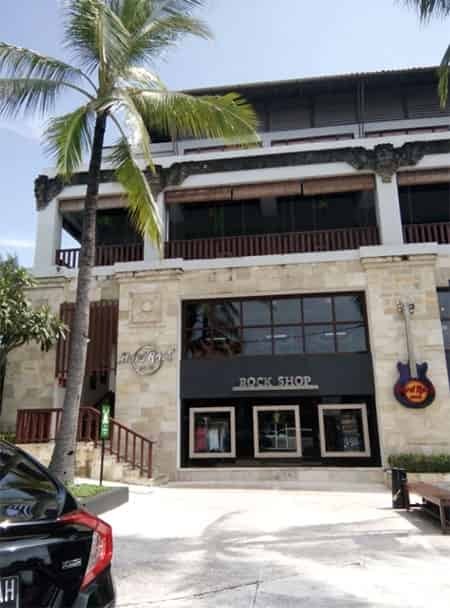 Take a time to look for original merchandise in Hard Rock Shop Kuta! To remind all the Kuta car rental renter if you stay in the area, under sunset time (between 5pm - 7pm) there will many visitor (local and overseas) who will come to the Kuta beach to see the sunset. So if you can, after make some trip with your Kuta car rental avoid to back to your hotel around that time. Try to make it before or after that time. Or you will stuck on traffic jam along the street! Happy driving anyway....!